We’d love your help. Let us know what’s wrong with this preview of Herr Pep. La prima stagione di Guardiola al Bayern Monaco vissuta dall'interno by Martí Perarnau. “Scrivi tutto quello che vedi. Puoi raccontare quello che vuoi” — Pep Guardiola a Martí Perarnau. Nell’estate del 2013, a Martí Perarnau è stato dato totale accesso al Bayern Monaco per seguire dall’interno la stagione 2013-14, la prima di Pep Guardiola alla guida della squadra tedesca, freschi vincitori di tre titoli nell’annata precedente. Questo libro è il racconto di u “Scrivi tutto quello che vedi. Puoi raccontare quello che vuoi” — Pep Guardiola a Martí Perarnau. Questo libro è il racconto di un’esperienza senza precedenti nell’epoca moderna, dato che per la prima volta è stata data la possibilità a uno scrittore di osservare così da vicino come funziona un club d’eccellenza del calcio mondiale. Su concessione di Guardiola, Perarnau ha seguito come un’ombra l’allenatore catalano, il suo staff tecnico e le stelle della squadra sia durante gli allenamenti che nei giorni delle partite. To ask other readers questions about Herr Pep. La prima stagione di Guardiola al Bayern Monaco vissuta dall'interno, please sign up. When you consider the fantastic opportunity afforded the author: total access for a year, with the freedom to write anything, I think Perarnau underachieves. The result is part valentine, part banal diary of the day to day operations of a big club. We learn things about the club, and individual players but nothing really insightful. Guardiola works obsessively. He prepares for every possible scenario. He is crushed to lose to Real Madrid in the Champions. As a soccer coach, I enjoyed every page, When you consider the fantastic opportunity afforded the author: total access for a year, with the freedom to write anything, I think Perarnau underachieves. One of the most fascinating questions of the 2012/13 football season involved a man who wasn’t involved in it, but instead retreated from the game for a year. Just about everyone involved in top level football wanted to know where Pep Guardiola would go, what he was going to do after creating one of history’s great teams. His Barcelona side were in the line of Cruyff’s Dutch side of the 1970s and Sacchi’s Milan early of the 90s, sides which redefined how the game should be played. Every major ta One of the most fascinating questions of the 2012/13 football season involved a man who wasn’t involved in it, but instead retreated from the game for a year. Just about everyone involved in top level football wanted to know where Pep Guardiola would go, what he was going to do after creating one of history’s great teams. His Barcelona side were in the line of Cruyff’s Dutch side of the 1970s and Sacchi’s Milan early of the 90s, sides which redefined how the game should be played. Every major tactical nuance seemed to derive from it; an action based on that style or a reaction to it. They accumulated trophies for fun with the footballing ideal of passing teams to death, adorned with footballing geniuses such as Leo Messi, Xavi and Andres Iniesta. And in the big games they produced signature displays, twice dismantling Manchester United in Champions League finals and recording several memorable victories over their great rivals Real Madrid. Guardiola’s reign lasted just four years, the man himself walking away quite visibly exhausted. One of Marti Perarnau’s great insights here is just how necessary Guardiola’s sabbatical was – throughout this book the restlessness of Guardiola’s mind and the energy he puts into training and coaching is clear. After four years of relentless pressure, of endless thinking about opponents and giving so much energy to the team there’s barely a human being alive who wouldn’t be burned out. The rest was necessary, particularly with the political pressures peculiar to Barcelona. A refreshing of body and mind was necessary. That he chose New York to get away from it all is quite probably unique. As Perarnau makes clear Guardiola was relentlessly pursued by many of the giants of European football, particularly from England. Many were willing to rebuild their sides just for him. His choice though was Bayern Munich, which in the end was as tough an assignment as he could have chosen. His predecessor, Jupp Heynckes ended up winning the treble of league, DFB Pokal and Champions League, a feat that had previously eluded even the mighty Bayern sides of the 1970s. Follow that. What we get is an exhaustive account of Guardiola’s first year at the club, from his decision to take over to the season’s end and beginning of preparations for the next year. The level of access is faintly surprising for the modern game, going in depth into how Guardiola prepares his team, how he adopted his footballing ideals to the style of a different country. Guardiola’s work ethic is clear, as is his inability not to think about football and his restless search for how to win games. It’s made very clear that a straightforward transposition of the Barca ideal to Germany was never considered possible, but instead Guardiola worked out over his first few months the tactical wrinkles that would make this Bayern side dominant and provide them with a footballing identity Hoeness and Rummenigge wanted when appointing him. What fascinates is how, for all Guardiola is a great thinker of the game, some innovations are a result of trial and error – their ultimate masterstroke, moving Philip Lahm into midfield, was a result of a solution to an in-game problem suggested by an assistant. But Guardiola had the vision to turn this into a long term solution that ultimately made Bayern’s game function so well, along with the deliberate tactic of pushing full backs forward into midfield. Perarnau giving us accounts of so many gams allows us to see how this team and the players develop over the first half of the season, adjusting between the approaches of Heynckes and Guardiola. This could of course veer toward hagiography, but it doesn’t. Guardiola’s good points are rightly lauded, but it’s always acknowledged he’s fallible – he talks of his own past tactical failings and how in the Champions League semi-final he makes egregious errors of judgement. And for all his hard work and innovation the team loses something of an edge after the league is secured ridiculously early. It’s an old footballing problem, but at this point you think that if anyone could find a solution to such an old saw you’re sure Guardiola could – something we’re likely to find out in the next year or two. What might surprise is how open Guardiola is about possible future plans – whilst events may obviously overtake him, the plan is for a similar length of stay to Barca, then another possible sabbatical followed possibly by a sojourn in the English game. Hints in the book say that he’d go to one of the historically big clubs – perhaps, like Bayern, the appointment of Louis van Gaal is merely the laying of groundwork for Guardiola to be tempted to Old Trafford? History seems to be more of an attraction to him than the nouveau riche billionaires at Stamford Bridge and the Etihad Stadium. We leave Guardiola on a note of triumph, the DFB Pokal secured to mark a treble of sorts with the league and World Club Cup. It sounds an ominous note for the rest of German football with a club now comfortable with Guardiola’s methods poised for perhaps an even greater dominance and the coach more comfortable than he was as Barcelona. Can he repeat his Barca trick of turning Bayern into Europe’s dominant force, overcoming the Madrid side that ultimately outplayed them in the Champions League semi-finals? As ever, only time has the answer. In the meantime, you can imagine coaches around Europe devouring this for hints and tips as to how to improve their own side and to undermine Guardiola. As an up close record of the methods of the man who’s probably the finest coach in the game today it’s a classic of intelligent modern footballing literature. The standout aspect about Martí Perarnau's writeup is how complete the entire book feels. It describes Guardiola's inspirations, methodology, tactics and interactions with players & bosses along with detours on Bayern & German football but at no point does any chapter feel vestigial. Individual preferences, however mean that each person might end up expecting a bit more depth in some facet of Pep's life. The writing style is pleasing - simply conveying the emotions without being overbearin The standout aspect about Martí Perarnau's writeup is how complete the entire book feels. The writing style is pleasing - simply conveying the emotions without being overbearing - if a bit adulatory. There is none of the drama of The Damned United while being much more friendly than Inverting The Pyramid. Que livro! Não é uma biografia, é um relato do 1º ano de Pep no Bayern. Suas conquistas, suas derrotas, seus acertos, suas mancadas e também suas mágicas. O livro mostra o empenho de Pep em transformar toda a cultura de jogo do time do Bayern para se adaptar ao seu estilo. Desde os treinos, táticas e jogos, até as conversas individuais com jogadores e relacionamento com a família. Tudo isso em uma escrita que prende do início ao fim! Top! One of the most fascinating and revealing books I’ve read about professional football (and I’ve read quite a few). The author had unprecedented access to Pep Guardiola – the young manager who took Barcelona to the zenith of their powers between 2009 and 2012, which was arguably to the best team ever to play the game – during his first season with the almost-as-formidable Bayern Munich. On the surface, the book is a diary of Guardiola’s first season with the German juggernaut, but it is in realit One of the most fascinating and revealing books I’ve read about professional football (and I’ve read quite a few). The author had unprecedented access to Pep Guardiola – the young manager who took Barcelona to the zenith of their powers between 2009 and 2012, which was arguably to the best team ever to play the game – during his first season with the almost-as-formidable Bayern Munich. On the surface, the book is a diary of Guardiola’s first season with the German juggernaut, but it is in reality about so much more: a penetrating look at soccer tactics, sports psychology, elite fitness demands, club politics, and, finally, the unrelenting quest for sporting perfection. Highly recommended for those with even a passing interest in soccer. Brilliant book, not because of the writing style but purely because of the content. You'll struggle to find such insight about a team and its season anywhere else, here you find it a few months after it happened. Love or hate Guardiola, he's one of the more complex and confusing coaches of this era. This book will help you understand a person who's often misunderstood. Here's a guy who really breathes football. It doesn't matter if you're a Bayern (or Barcelona) fan or not, I'd recommend you to re Brilliant book, not because of the writing style but purely because of the content. You'll struggle to find such insight about a team and its season anywhere else, here you find it a few months after it happened. I read heaps of football books each year and this is in my top5 ever. You never get as much insight into a world class (if not the best today) manager like Pep and into a modern superclub like Bayern. Beautiful insight on coaching, fitness, injuries, transfers, getting inside players, manager, coaches, analysts, directors and fans heads. A MUST read for any with a minimal or bigger interest in how things work and happen on the very top level. Intimate scenes fill Pep Confidential. Perarnau’s narrative offers an astonishingly comprehensive account of Pep’s first year at the Säbener Straße, thanks to author’s unlimited access to Bayern’s staff, players, facilities, and to Pep himself, as Perarnau shadowed the celebrated coach through the entirety of his first year in Munich. The result is a carefully-layered portrait of world football’s most compelling auteur. However, the book is much more than simply a retelling of the Pep’s first seas Intimate scenes fill Pep Confidential. However, the book is much more than simply a retelling of the Pep’s first season at Bayern; it also functions as what is surely the most in-depth examination of Pep’s famed (and oftentimes misunderstood) coaching philosophy, methods, and tactics in the English language. This book will certainly please both the biography-craving set of readers, as well as the Zonal Marking set. In his year-long account, Perarnau’s balances story-telling with deeply sophisticated, yet immensely accessible, tactical discussions both of Bayern’s training sessions and matches. How did this book come about? The question is worth asking, given the Spaniard coach’s reputations for secrecy and control. Two explanations: first, Perarnau was already planning a lengthy project on Pep’s first year at Bayern. Second, when Guardiola himself was looking for a writer to document his German adventure – one whom he planned to grant unfettered access to – Perarnau emerged as a natural candidate, due to his friendship with Pep’s longtime companion and assistant coach, Manel Estiarte (“the Maradona of Water Polo,” according to Pep). Thus, a unique opportunity was born. Perarnau was granted access to all team meetings, all training sessions, the locker room during matches, Pep’s office, as well as other intimate settings, like the team lounge/restaurant after matches, on the road with the team, or simply one-on-one coffee outings with individual players. For lovers of football narrative, Perarnau’s access to footballing elite is mouth-watering stuff. And the former-athlete-turned-journalist doesn’t disappoint readers with his privileged access. "I hate tiquitaca. I hate it. Tiquitaca means passing the ball for the sake of it, with no clear intention. And it’s pointless. Don’t believe what people say. Barça didn’t do tiquitaca! It’s completely made up! Don’t believe a word of it! In all team sports, the secret is to overload one side of the pitch so that the opponent must tilt its own defence to cope. You overload on one side and draw them in so that they leave the other side weak. And when we’ve done all that, we attack and score from the other side." We also learn that, in some key ways, Pep adapted his methods to his Bayern players and to the wider Bundesliga football culture, rather than reshape the Bavarians in dictatorial top-down fashion. Or we learn that that Pep is not doggedly committed to the short passing game as the heart of his philosophy; rather, it’s tactical flexibility – grounded in a few key principles – that define Pep’s on-pitch philosophy. Through the detritus of story-bits and quotes, Perarnau produces a lucid picture of Pep’s methods and tactics. For any football fan, Pep Confidential is worth the price of admission for these discussions alone. In terms of playing philosophy, we learn that Pep covets ball possession because he covets attack and wishes to avoid (a form of footballing anxiety?) a whole set of defensive situations. So Bayern’s short passing game will be always (at least theoretically!) in the service of this goal. Pep frames short passing in basketball terms, as he explains: “In basketball if you are dribbling the ball all the time, the defence has an easier time of it. But if instead you pass it rapidly from one player to another you create huge problems for your opponents. It’s exactly the same in football.” Later, we learn that Bayern’s stars ceaselessly work to exploit new spaces via the short passing, especially in the opponent’s box. Perarnau breaks down other aspects of Pep’s complicated tactical system into discrete units. Pep’s tactical principles range from the positioning of the defensive line, the famed “15 pass build-up,” “managing the free man,” playing and moving forward from the back in total unison, superiority in the midfield (“This is the essence of Pep’s playing philosophy” as Perarnau explains), false attacking midfielders (“This is the big tactical innovation within Pep’s first season”), and playing without the false 9 (“From being the absolute key figure at Barcelona, the false 9 is now just one more potential tactic for Bayern”; Perarnau tells the origin story of Pep using of the false 9 at Barça). Moreover, Pep adapts prevalent German tactics into Bayern’s strategy, such as counter-attacks (Pep “sometimes branded it the Bundesliga-counter, based on the efficacy and speed of the counters he has had to plan for”), aerial passing, width across the pitch, or the double pivote in midfield. Perarnau observes Pep making in-match adjustments according to these principles. The players are divided into three groups. In each group, six players form a circle. Their aim is to pass the ball to each other as quickly as possible whilst their two team-mates inside the circle try to stop them. Today the Bayern players are much less fluid than their Barcelona counterparts who have been doing this since they were kids. In fact, the champions of Europe appear a little slow and clumsy as they struggle through the exercise. Pep scratches his head. Apparently his players have come here expecting athletics training and here they are kicking a ball about. Indeed, Perarnau amusingly reports that the Bayern players ask Pep’s permission to do some intense running after “kicking a ball about” in order to feel like real work was done. Pep obliges, but explains the truth to Perarnau: “Now they’ll come back thinking that they’ve trained really hard because they’ve had a 15-minute run, but it’s just the placebo effect. They think that when they’re doing these positioning and conservation exercises that they’re not really working.” A new way of doing things has indeed arrived at the Säbener Straße. Starting with this first training session through all 279 sessions, Perarnau documents the various personalities on Bayern’s squad. We learn that Pep immediately has deep affection for the young Dane Pierre-Emile Højbjerg (both player and coach will later weep together inconsolably during the season, at one point), sees great potential Jerome Boateng, explains things repeatedly to the big-hearted “street kid” Franck Ribéry, talks football tactics nonstop with Basti, huddles with Philipp Lahn for long stretches on the pitch talking long term strategy, troubles over Mario Mandzukic’s passionate work ethic but tempestuous attitude, or admires Arjen Robben’s immense work ethic and injury prevention routines. Through these training pitch moments, as well as dozens of vignettes of Pep in his office, in the restaurant lounge, or at home, Perarnau composes a portrait of an utterly football tactics mad coach, obsessional in his pursuit of the right tactical dynamics for each match. Pep is the classic first in / last out of the training center type, working long hours alone or with his assistants incessantly searching for tactical ways to disable his opponents. Estiarte jokes about the “law of 32 minutes” when it comes to Pep: “‘You invite him for a meal in a restaurant, hoping that he’ll forget about football, but 32 minutes later you can see his mind is already wandering.” Pep is so deeply emerged in his craft that Estiarte speaks about saving the man from himself. However, Pep possesses more than simple obsession. Perarnau reveals a man wracked with intense anxiety, yet gifted with superb prescience. Interpersonally, we learn that Pep is skilled in offering his players individuated instruction, stemming from a framework he developed after studying the subject and even attending class at Columbia University in New York during his sabbatical. Perarnau also illustrates Pep’s ability to take complete responsibility for any and all outcomes during the season. For example, this virtue is especially displayed after Pep’s historic dismantling at the hands of Real Madrid in the Champions League. These character traits combine to create the portrait of a fascinating human being – a sort of switchboard of mental and physical activity. Pep himself manically hums with ideas and actions in Perarnau’s account. The coach is exhausting. My critiques of Pep Confidential mostly stem from my own commitments about what a book like this should do. Specifically, I wish Perarnau would’ve pushed for his narrative’s meaning in three ways. First, despite the carefully-layered portrait of Pep developed through 488 pages, I was still left wondering who Pep really is, especially why he’s so utterly committed to football, to sport, or (basically) to play itself. Why? Ultimately, this question can be asked about any cultural figure, especially artists, athletes, and performers. And I sort of already know the answer to my question. We need “purposiveless” activity like sport, or, frankly, culture itself. In this sense, Pep is like any artist or craft person, obsessively pursuing excellence. Nonetheless, I’m always very intrigued by the answer artists themselves give to my question. A missed opportunity, because someone as crazily committed as Pep just begs this question. Second, I would have liked a more robust interpretive framework from Perarnau around his own narrative – something like an interpretive epilogue, or “what does this mean?” check-ins scattered throughout the narrative. I say this, because Perarnau’s narrative is so richly populated with anecdotes, quotes, and observations that the larger interpretive picture becomes foggy. Perhaps this fogginess is the point, however, given Perarnau’s own immersion at the Säbener Straße, and the manic quality of Pep’s character. Regardless, I still expected slightly more framing from the author in this regard, as a way of cashing in on his privileged access. Third, Perarnau would have benefited from a (even brief!) background discussion of German footballing history and culture to help establish a framework for understanding Pep’s work at Bayern. For example, we learn in piecemeal fashion about the physicality and enormous work rates of German players, as well as the Bundesliga’s reputation for skilled counter-attacking. We also learn that Pep is both smitten with German footballing culture and values, yet comes to chafe against this same culture by the time his first season ends and his methods are criticized in the media. That is, Pep really does embark on a footballing project against the grain in Germany, yet the details of this tension are left somewhat undeveloped. Nonetheless, Pep Confidential remains required reading on multiple fronts. The book is indispensable for lovers of biography, narrative, and modern football tactics. Or even readers from fields outside football, studying leadership, quality, excellence, and strategic planning. Leitura obrigatória pra quem gosta de futebol. Guardiola não inventou nada, apenas aperfeiçoou e implantou conceitos e ideias, mas a paixão e a quase "loucura" pelo esporte são admiráveis. Li o livro na intenção de tentar entender melhor a personalidade do vencedor técnico Guardiola. Acredito que em partes o livro entrega isso, nos capítulos que analisa os trejeitos dele, suas relações pessoais, familiares, com os jogadores e suas idiossincrasias. Além disso, o livro tem uma estrutura um pouco repetitiva (Pep pensando sobre o jogo - jogo - pep pensando sobre o jogo - jogo). No geral, é uma biografia interessante sobre um personagem interessante. Si antes se decía con cierta regularidad que Pep Guardiola es un genio, este libro nos da una vista íntima del porqué. Una obra que en ocasiones peca de exaltar de más los aspectos más positivos del entrenador, y me parece que es más por la notable admiración que el autor siente hacia la figura de Guardiola, pero, él conoce al hombre, la mayoría solo le vemos desde fuera. Pep Guardiola’s managerial record is, by any measure, astounding. 3 La Ligas, 2 Copa Del Reys, 3 Spanish Super Cups, 2 Champions Leagues, 3 European Super Cups, 3 FIFA World Club Cups, 3 Bundesligas, 2 German Cups, 1 Premier League, 1 EFL Cup and 1 Community Shield - all within the space of 10 years. And yet somehow, in a way I still find utterly bizarre, Marti Perarnau’s most astonishing feat as author of this biography of Pep Guardiola is to actually leave the more astute reader with a signifi Pep Guardiola’s managerial record is, by any measure, astounding. And yet somehow, in a way I still find utterly bizarre, Marti Perarnau’s most astonishing feat as author of this biography of Pep Guardiola is to actually leave the more astute reader with a significantly lesser opinion of the man commonly thought of as “the best manager in world football”. To completely misquote Winston Churchill in a completely unrelated context, never have so many words been given to so few actual achievements in Guardiola’s first season as Bayern Munich manager (the sole period this biography chronicles). Yes, Bayern won the Bundesliga league and German Cup double in this 2013-14 season, but as the biggest club in Germany, with by far the best squad and coming off a treble-winning season under the previous manager Jupp Heynckes, this was practically a fait accompli on day 1. Expectations were much higher and therefore a sense of abject failure at the end of Pep’s first season looms very large, particularly in the final quarter of the book. In many respects, this book is doomed to fail before it even begins. Primarily, this is because close observers of Pep’s career will note that not only did he fail to win the Champions League (the pinnacle of world club football) in his first season at Bayern, but he failed to win it in any of his 3 seasons there - and even more significantly, he was knocked out each time in very embarrassing fashion, for both himself and his team (similar could be said of his next 2 seasons at Manchester City too). Perarnau is far too much of a sycophant to admit it, but the only reason Bayern hired Pep was to win them the Champions League. To say Perarnau’s book has not aged well is an understatement for this reason. To be completely honest, the narrative structure of the book as it chronologically runs through the season is also frequently boring, something I notice other reviewers have also observed. So why has Perenau’s book been serenaded with so much praise and reverence since the time it was published? The answer is simple: the myth of Pep Guardiola is so entrenched in the modern footballing world that any attempt to open up the enigma and understanding the working of this man is met with an almost palpable relief, particularly by the media community (see also the volcanic response to the recent Amazon documentary of Manchester City’s Premier League title winning season under Pep last year). At last we can have a look inside the box and observe the genius! To be frank, this explains the majority of my excitement too before I had even ripped off the excessive Amazon packaging and started reading the book. Except, fatally, the lack of actual genius is astonishing by virtue of its absence throughout this book. Pep’s tactical “revolution” in European football can be distilled into 3 core concepts. First, superiority in midfield in order to dominate the game with the ball (numerical and positional) - led by an indispensable “pivote” playing as the number 6 in central midfield. Second, a high defensive line, so that the team is able to attack high up the pitch. Third, using full backs as false attacking midfielders high up the pitch to immediately cut off counter attacks of opponents. All of these are, as Pep himself acknowledges, football ideologies taken directly from the school of Johan Cruyff, under whom Guardiola played at Barcelona and considered his footballing mentor. So far, so good. Except, when you look at these innovations in closer detail, certain inconsistencies arise. For example, is there anything particularly unique about the idea of a “pivote” in European football? Almost every major team in Europe plays some variant of 4-3-3 or 4-2-3-1 with a player or player(s) in the “pivote” role. Ah, but Pep eulogisers would argue, Guardiola’s innovation has been the use of only a single “pivote”, whereas most teams in Europe play in this era in a 4-2-3-1 with 2 players in this holding role. Sounds like a reasonable argument - except, in Bayern’s most important win of the 2013-14 season, in the Champions League Quarter Final second leg against Manchester United in Munich, the team was being comprehensively outplayed by a mediocre United team, until Pep was forced to abandon his single “pivote” and play Lahm and Goetze as double “pivotes” in a 4-2-3-1, a tacit acknowledgement that his initial formation had failed. The change back to the system the same team had won the treble with the prior season (and were more comfortable with) was the turning point and Bayern stumbled through to the next round. There is this bizarre moment towards the end of the book when Pep, in response to a characteristically obsequious question from Perarnau, claims that the best moments of football in the season were wins against Arsenal in the Champions League round of 16, Manchester United in the Quarter Finals and Bayer Leverkusen to effectively clinch the Bundesliga title. Really? Bayern scraped through against an average Arsenal team (and could well have been been knocked out if Mesut Özil hadn’t missed a penalty in the first 15 minutes with the second leg at 0-0), they then barely beat a mediocre United team managed by David Moyes (the worst manager in United’s recent history) and they won the Bundesliga at a canter because they’ve spent the last 10 years cherry-picking and buying the rest of the league’s best players. Casual football observers or Guardiola fans who are not partial to objective analysis have - in the time since this book was published - used Perarnau’s book as a reference point with which to lavish praise on Guardiola’s genius. No doubt, there are many, many praiseworthy elements of Guardiola’s coaching - not least his bravery in being an attacking football ideologue, particularly in an era where Mourinho, Ancelotti and Benitez were dominating European football with more pragmatic and defensive setups. Pep is undoubtedly a world class coach by any measure. However, Perarnau’s only major achievement with this book is perversely to raise very many troubling questions about just how much of a genius Pep Guardiola really is. For example, it’s clear that for Guardiola’s intricate system to work, he essentially needs to either inherit a squad that is largely familiar with his “Cruyff-ian” principles (e.g. at Barcelona) or he needs to rebuild a squad by bringing in players who he can adapt and coach to his system (e.g. currently at Manchester City). But isn’t the obvious implication that - outside of Barcelona - he requires large sums of money to buy the world class players that he needs to build a new squad wherever he goes? Isn’t he then - as many of his detractors have argued - just a “chequebook manager”? In 3 years at Manchester City alone he has spent circa £400m net, more than any other team in Europe except PSG. And wouldn’t this explain why he essentially failed at Bayern, who are famous for their typically German restraint in the transfer market and only brought in a handful of inexpensive new signings while Pep was manager? ideologically-wedded to a certain system, why did he abruptly abandon this system to play 4-2-4 against Real Madrid in the Champions League semi final second leg, where Bayern were destroyed 4-0? In the buildup to this game, Perarnau chronicles how Pep changed his mind 4 times regarding which system he would play - smacking more of indecision and uncertainty than genius. More troublingly, in the following seasons Pep has been dumped out of the Champions League by Barcelona, Atletico Madrid, Monaco and Liverpool - all without exception in humiliating fashion. Have elite European teams in the latter stages of Europe’s premier cup competition learned quickly that the way to beat Pep’s teams in a one-off cup tie is to allow them to dominate the midfield with possession and then strike swiftly and decisively via the counter-press and subsequent counter-attack? It would seem so, but Perarnau is far too preoccupied with glorifying Pep than to consider such questions. One could even argue that the real hero of this book is not Guardiola, but Jurgen Klopp, who humbles Bayern in the German Super Cup (Pep’s first competitive match) and then again 3-0 in the Bundesliga later in the season. Klopp, of course, who has been a leading pioneer in European football of the counter-press and counter-attack over the past decade, and continues to be Pep’s bête noire in the present day Premier League. In life there are times when one is exhausted by what one loves to do. It is when one is out option and monotony of daily routine becomes an unbearable case. This monotony is necessary and in other words called hard work which to find success, has to be in consistent with. Similar was the case with Pep Guardiola, in 2012 the Barcelona coach, after winning each and every trophy or championship by rallying his troops of 11 men on a grass field consistently for four years. He was the inventor of a In life there are times when one is exhausted by what one loves to do. It is when one is out option and monotony of daily routine becomes an unbearable case. This monotony is necessary and in other words called hard work which to find success, has to be in consistent with. Similar was the case with Pep Guardiola, in 2012 the Barcelona coach, after winning each and every trophy or championship by rallying his troops of 11 men on a grass field consistently for four years. He was the inventor of a new phase a football in this second decade of 21st century, the dominance of one team. But then he needed a new challenge, and took a year off and went to Bayern Munich, another european giant with success in its bloods. To fill the pages of Pep Confidential: The Inside Story of Pep Guardiola’s First Season at Bayern Munich, the Spanish journalist, Marti Perarnau, was given access to chronicle Pep’s day to day thoughts, methods, and the new challenge he’s has taken himself. The book consists more than Pep Guardiola’s first season in Germany. It is the complete portrait of one of the greatest football coaches of 21st century. It consists the philosophy by which Pep works everyday and the functionality he adopts at Bayern Munich in 2013. His methods, tactics, philosophy, his emotional touch to the game and his obsessiveness for the game of football. Perarnau was granted access to all team meetings, training sessions, locker room, face to face over a coffee with Pep at times, his left and right hand men, the players and has done a good job by accounting that much in sheer 488 pages. That season of 2013-14 Bayern mashed domestic records on their way to the double. The author does not fail to account Pep’s ideas and how he sees his team playing on the green grass rather than the media and world. They very infamous obligation of playing tiquitaca at Barcelona, Pep justifies that he in fact, hates “passing ball just for the sake of it, with no clear intention. And it’s pointless”, he says. He just happens to love possession football but that gives him more chance to attack and score and every person passionate enough about the game hasn’t failed to notice that. Guardiola Confidencial é um livro com escopo definido: relatar como foi a primeira temporada de Pep Guardiola à frente do Bayern de Munique. O que pensou, os desafios que enfrentou, como os encarou. Não pretende em nenhum momento ser uma biografia, o que é um acerto, já que Guardiola é um personagem em construção e sua história, se não está apenas começando, está muito longe do final. A principal qualidade do livro é que trata o tempo inteiro de futebol. O ponto de vista é o de Pep, ou melhor, de Guardiola Confidencial é um livro com escopo definido: relatar como foi a primeira temporada de Pep Guardiola à frente do Bayern de Munique. O que pensou, os desafios que enfrentou, como os encarou. Não pretende em nenhum momento ser uma biografia, o que é um acerto, já que Guardiola é um personagem em construção e sua história, se não está apenas começando, está muito longe do final. A principal qualidade do livro é que trata o tempo inteiro de futebol. O ponto de vista é o de Pep, ou melhor, de Pep visto pelo autor, Martí Perarnau, um jornalista catalão que acompanhou Guardiola e o Bayern na temporada 2013-14. Para quem gosta do jogo, é um prato cheio. No meu caso, finalmente entendi por que Robben só foi vingar depois dos 30 anos, ou o que Thiago tem, afinal, de tão especial. O autor dedica boa parte do tempo em descrever esquemas de jogo, as funções dos jogadores, as estratégias que deram certo. Nesses momentos, mesmo quem gosta de futebol como eu pode ficar um pouco entediado, mas nada que coloque a leitura em xeque. Como os capítulos estão dispostos em ordem cronológica, logo chega o próximo jogo e a leitura flui novamente. Para quem não é tão fã de futebol assim ou não liga muito para os detalhes técnicos do jogo a leitura deve seguir muito mais arrastada. Ainda que o autor intercale análises táticas com descrições da personalidade de Guardiola, o tom do livro não muda. Pep vive futebol, só pensa em futebol, então falar sobre ele significa falar mais sobre…futebol. Eu gostei de ler um livro só sobre futebol. Não tinha grande interesse em saber de Guardiola para além do jogo, por isso fiquei satisfeito. Porém, o autor não é um observador isento: participa de momentos íntimos da vida do treinador e do clube, como reuniões pré-jogo, jantares pós-jogo; ouve confissões, sempre exclusivamente sobre futebol, do treinador e sua equipe. Perarnau parece sentir-se privilegiado e o resultado é um relato de um Guardiola sem defeitos. A sensação ao terminar o livro é de um Guardiola genial tecnicamente ao mesmo tempo em que consegue ser perfeito emocionalmente. Aspectos negativos da personalidade de Guardiola - como o excessivo controle sobre a vida dos jogadores, não aparecem em nenhum momento da narrativa. 3. Se você tem interesse em biografias ou histórias do futebol mas não é fã do esporte em si, melhor ler e dar boas risadas com o livro do Vampeta ou do Marcos. Esiteks pean tunnistama, et raamatu tekkelugu on tõepoolest ennekuulmatu. Et sellise renomeega treener lubab ühel inimesel terve hooaja meeskonnaga kaasas jõlkuda - nii heas kui halvas - kõlab uskumatult. Kahjuks ei lugenud ma ei ridadelt ega ridade vahelt välja, mis suhe Perarnau Pepiga täpselt oli ja kuidas sellise suhteni jõuti. Igatahes meenutab situatsioon natuke "House of Cardsi" sarjas kirjanik Tom Yatesi all-accessi Valgesse Majja. Perarnau pääses ligi tõepoolest väärt materjalile, mis av Esiteks pean tunnistama, et raamatu tekkelugu on tõepoolest ennekuulmatu. Et sellise renomeega treener lubab ühel inimesel terve hooaja meeskonnaga kaasas jõlkuda - nii heas kui halvas - kõlab uskumatult. Kahjuks ei lugenud ma ei ridadelt ega ridade vahelt välja, mis suhe Perarnau Pepiga täpselt oli ja kuidas sellise suhteni jõuti. Igatahes meenutab situatsioon natuke "House of Cardsi" sarjas kirjanik Tom Yatesi all-accessi Valgesse Majja. Perarnau pääses ligi tõepoolest väärt materjalile, mis avab hästi Pepi treenerifilosoofia. Näiteks on talle omistatav tiki-taka mängustiil hoopis sõimusõna, mida kasutada mõttetu pallivaldamise kohta. Või kuidas Pep on iseenda kõige karmim kriitik, näiteks pärast 0:4 Real Madridile kaotatud Meistrite Liiga poolfinaali. Ühe hooaja käigu kohta lugedes tekkis soov saada rohkem teada ka Pepi ülejäänud Bayerni-karjäärist. Miks jäi ikkagi Bayernil Meistrite Liiga koos Pepiga võitmata? Lugedes häiris, et Meistrite Liigast rääkides kasutati sellist kirjapilti ainult vist korra. Korra jäi silma "meistriteliiga", kuid üldiselt oli tõlkija valinud kirjapildiks "meistriliiga". Mis jalgpallihuvilistest lugejate jaoks on kõige valem valik, sest see sõna tähendab riikide koduseid meistrivõistlusi. Isegi inglise keeles kasutatakse ju Champions League'i nimes meistrite kohta mitmust. Rääkimata lihtsast eksimusest, kuidas Bayern võitis mänge 0:5 ja 1:2. Need ei ole võidud. Sedasi pannakse kirja kaotusi. Ehk siis ühesõnaga oleks mõni jalgpallihuviline võinud tõlke veel üle lugeda. Muus osas ei jää aga tõlge raamatu nautimisele ette. Like many said, with the opportunity the author had, i expected a lot more exclusive content and behind the scenes material. There isn't that much. Which is really disappointing, because when it does, it's awesome. Of course, we don't know for sure what "unrestricted access" really meant. There could have been a lot of informal agreements of what could be written and not for the author to remain with the group. There are awesome moments, boring ones when nothing interesting happens and most of the Like many said, with the opportunity the author had, i expected a lot more exclusive content and behind the scenes material. There isn't that much. There are awesome moments, boring ones when nothing interesting happens and most of the book is good. The author reveres Pep, that much is super clear in the book. Another let down is that whenever Pep talks good about a player, this get's a whole chapter of praise. But there's never a more acid or angry talk with anyone in particular. The author just writes "Pep was not happy and told the players that". "Pep was not satisfied with X". What does that mean? Did he swore at them? What did he really said? What he said to motivate? What he says to demand something from the player? How he really explain things? Detailing the individual and team management of players could be the highest point of the book, specially when things went bad. But the author never does that, and it's clear it's to preserve the image of the coach. It was not authentic journalism. Es muy fácil hacer juicios desde una silla, comiendo papitas. Cuando vemos el trasfondo de la primera temporada de Pep al frente de un equipo que venía de ganarlo todo (Triplete), te das cuenta de que en ocasiones, no ganar campeonatos no es sinónimo de fracaso. Prueba de ello, el haber ganado 4 campeonatos en su primera temporada con el Bayern teniendo a medio equipo lesionado más de media temporada. Sus sistemas tácticos, sus ideales, su manera de entender el fútbol ¡Guardiolismo en estado puro! Sus sistemas tácticos, sus ideales, su manera de entender el fútbol, el por qué de cada parado táctico, la manera de afrontar cada entrenamiento... ¡Uf! ¡Un auténtico revolucionario del fútbol! El libro es perfecto, conoces más a fondo a Pep, al Club, los por qués; te das cuenta de que hay cosas que creías que eran de una manera y la realidad es otra, por ejemplo, el Tiquitaca. ¡Odio eterno al Tiquitaca! Ojalá hagan algo similar en Manchester, porque de estos libros se aprende muchísimo. Sus tácticas, su pasión extrema... hay cosas que no solamente se aplican al fútbol o al deporte, sino a la vida diaria. Pep es un maestro en toda la extensión de la palabra. No son lecciones de fútbol, son lecciones de vida. Un lujo de libro. Martí Perarnau detalla la primera temporada de Pep en el conjunto muniqués. Con su lectura, comprenderás cómo funciona una mente tan compleja y obsesiva como la de Guardiola, por no hablar de que conocerás al detalle la metodología de trabajo implacable que éste sigue. "Un equipo es un se Un lujo de libro. Martí Perarnau detalla la primera temporada de Pep en el conjunto muniqués. Con su lectura, comprenderás cómo funciona una mente tan compleja y obsesiva como la de Guardiola, por no hablar de que conocerás al detalle la metodología de trabajo implacable que éste sigue. "Un equipo es un ser vivo y no una foto fija. Fluye, crece, retrocede, avanza... Un equipo son momentos que marcan los éxitos. Un equipo es muchísimo más que un estado de ánimo, pero también es un estado de ánimo. Un equipo es táctica y trabajo, pero también talento y eficacia. Es entrenamiento e ideas claras, pero también es emoción y sentimiento. La prosa sencilla de Martí Perarnau acompaña con sobriedad las vivencias de Pep Guardiola en su primer año como entrenador del FC Bayern Múnich. Las anécdotas relacionadas a los partidos claves de la temporada revelan su obsesiva gestión para mantener el espíritu competitivo de un equipo que había conquistado el triplete en la temporada anterior, además de mostrar sus distintas facetas (familia, amistades; trato con los jugadores, el club y la prensa, etc.) que lo hacen humano y mortal como uno La prosa sencilla de Martí Perarnau acompaña con sobriedad las vivencias de Pep Guardiola en su primer año como entrenador del FC Bayern Múnich. Las anécdotas relacionadas a los partidos claves de la temporada revelan su obsesiva gestión para mantener el espíritu competitivo de un equipo que había conquistado el triplete en la temporada anterior, además de mostrar sus distintas facetas (familia, amistades; trato con los jugadores, el club y la prensa, etc.) que lo hacen humano y mortal como uno más. Es una lectura que, si bien requiere de conocimientos básicos de fútbol para entenderla, aporta enseñanzas que van mucho más allá: la pasión por los detalles, la gestión del riesgo contra la incertidumbre, evitar la zona de confort y dejar de lado los egos individuales, en pos de los objetivos de grupo. Es un llibre interessant pels amants del futbol i es llegeix en un parell de sentades doncs esta ben escrit i es entretingut. A altres païssos-sobretot a Anglaterra- hi ha tradiccio de bona literatura esportiva, a veure si se'ns contagia. Penso que seria molt mes interessant aquest mateix llibre de la etapa blaugrana, entre altres coses ja que l'alemana no ha acabat. M'ha cridat l'atencio que al Pep li agraden els equips de joves, i com diu que potser acabara entrenant a la cantera, en un retorn a Es un llibre interessant pels amants del futbol i es llegeix en un parell de sentades doncs esta ben escrit i es entretingut. A altres païssos-sobretot a Anglaterra- hi ha tradiccio de bona literatura esportiva, a veure si se'ns contagia. Great book, first sports book I've ever read. 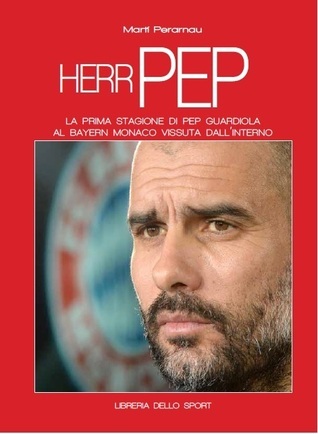 I will definitely be reading Perarnau's other book about rest of Pep's seasons at Bayern Munich. This book follows Pep's first season at Bayern Munich right after they won the treble with Jupp Heynckes. Perarnau was given incredible access to Pep, the players, and the staff which wasn't taken full advantage of. However, the book is still provides quite a bit of insight into Pep's preparations for a match, team training, thoughts on team injuries and Great book, first sports book I've ever read. I will definitely be reading Perarnau's other book about rest of Pep's seasons at Bayern Munich. This book follows Pep's first season at Bayern Munich right after they won the treble with Jupp Heynckes. Perarnau was given incredible access to Pep, the players, and the staff which wasn't taken full advantage of. However, the book is still provides quite a bit of insight into Pep's preparations for a match, team training, thoughts on team injuries and a few interviews. I would definitely recommend this book to any sports fan! A fantastic book, a must read for any football fan. It's a very rare insight into not only one of the greatest young managers in the world today, but also into one of the biggest clubs in the world today. From great triumphs to personal tragedies, this book is no holds barred as to how Pep Guardiola not only devotes his time to his team, but his entire life to the beautiful game. If you like football only a little bit, this book should be not on the shelf, but in your hands. Just brilliant! This review has been hidden because it contains spoilers. To view it, click here. O autor tinha a chance de explorar mais profundamente a rotina de Pep, eu penso. Senti falta de detalhes mais densos sobre a relação com Mandzukic, por exemplo, ou sobre as contratações. Como Pep influencia nessas decisões e etc. Ainda assim Pep é mesmo um revolucionário. As suas ideias de roubar a bola no campo avançado e destruir contra-ataques. As críticas ao toque de bola sem finalidade (tique-taca) e todo o mais retratado no livro valem a pena a leitura. An interesting account of Guardiola's first year in Munich, filled with inside stories. While the author's admiration for Pep can sound a bit excessive at times (even if the portrayed manager is indeed very impressive), this book is still an interesting read both for those interested in the Guardiola phenomenon and for those who want to see how Bayern coped with the highs and lows of their first post-Heynckes year.